It is a peculiar place we find ourselves in as we step into a future of unchartered territory. Though mankind has been quite confident that its technological, academic and social progress will anchor it, if ever the upheavals of the past were to revisit, and though Steven Pinker would have you believe that we have never witnessed a more peaceful and prosperous time than today, yet we don’t find ourselves as relaxed as we ought to be in a world that is largely free. What are the concerning issues of our time? What are the current global trends in technology, politics and religion? And, most importantly, how do we resolve the challenges we face as we become accustomed to a rapidly changing world? Yuval Noah Harari has now become a familiar name. The author of Sapiens and Homo Deus returns with a third international best seller as he explores 21 pressing issues related to how technology will interfere with our lives, how politics will change as a result and what role does God now play in the 21st century? He begins by exploring the changing socio-political landscape affected through technological change. This is interesting for a number of reasons; primarily because since the industrial revolution, never has mankind been at the threshold of such a massive change in the way it lives owed chiefly due to progress in technology. Very true since the nature of our lives are being altered ever since technology has been playing an incredibly intimate role in them. When you couple this to the development of AI (artificial intelligence) it “confronts us with the biggest challenges humankind has ever encountered”. For instance, technology has already replaced a wide range of jobs and some believe that within a few decades, billions will become economically redundant. A very important and pressing question naturally arises as to which system of government has the ability to successfully deal with such an upheaval? A drastic change in the nature of how we humans function in society will have far reaching implications since we live in a world where economic value is heavily attached to the standard of living. Though we may have difficulty trying to pre-determine the full effects of technological change, something that is apparent now is the threat posed to the liberal ideology. Harari calls it a “disillusionment” to the liberal story which began after the global financial crisis of 2008. “Resistance to immigration and to trade agreements is mounting”, he writes, pointing towards the election of Donald Trump and the rise of nationalism, and rightly so. Financial instability has played not just a role, but arguably the role in sparking into existence the pre-requisites of major conflicts. It is true that the so-called caliphate of the Middle East does not represent Islam in the slightest, but it is incorrect to suggest that Islam cannot be the saviour to a sinking financial system. If religion is to re-establish communities, according to Harari, it must cater and be able to successfully address three types of problems; technical problems (“how should farmers in arid countries deal with severe droughts caused by global warming”), policy problems and identity problems. It is certainly true that a true faith would address the issues above (though it should address a lot more), but what is perhaps incorrect is the author’s belief that “traditional religions are irrelevant to technical and policy problems” for Islamic theology is filled with discussions on these topics, all deriving of the Holy Quran. For example, matters of policy have been outlined in depth in the Holy Quran with guiding principles for all its off-shoots. We further see a practical example of this in the life of the Founder of Islam who brought into existence the Treaty of Medina 500 years before the Magna Carta. Harari dedicates an entire section highlighting the issues with Islamic economics claiming that when Islamic leaders make economic or policy decisions they always look towards the West before turning towards the Holy Quran to find something similar. He concludes with the word, “Religion doesn’t really have much to contribute to the great policy debates of our time”. So, the question naturally arises as to where, in today’s time, do we see Islamic policies, derivative of the Holy Quran, being practiced? The answer is not a country, but a community. Founded in 1889, this community is an organised and structured community, which has every aspect of its administration governed by Islamic law. 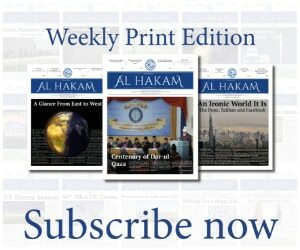 Its financial system rests entirely on the precepts of the Quranic verses, its system of community leadership is not based upon a Western-styled hierarchy, but resembles the way in which Hazrat Umarra established his government, with the Shura (consultative body) being an excellent example of it. Harari perhaps has only heard of the pretend caliphate of the Middle East, but it is only in the the Ahmadiyya Muslim Jamaat that one can find a system of true Islamic law headed by a divinely appointed Khalifa. Proof of the success of such a claim can simply be attained upon reading the history of the Ahmadiyya Movement in Islam. Though the Ahmadiyya Muslim Jamaat has no interest in worldly political gains and its aims are not to govern nations, but when political scenarios give rise to social issues, on the precepts of the state of Medina it adheres to the same Islamic principles and policies. The chapter on God is also lacking a full understanding of the concept of Divinity. It is unfair to suggest that “we do not know the answers to these questions, and we give our ignorance the grand name of God”, for there are many that base their beliefs in direct experience with God. One cannot help conclude that a staunch atheistic perspective has been given the garb of reality – as if we all agree to his statement: “We cannot say anything concrete about Him”. Harari’s narrative is more of an open attack against God as opposed to a discussion. It is such matters that draw credibility away from his entire thesis because it is incredibly vital to judge the problems that we face in the 21st century from an unbiased viewpoint – otherwise it just becomes an atheist’s version of the challenges we will face. 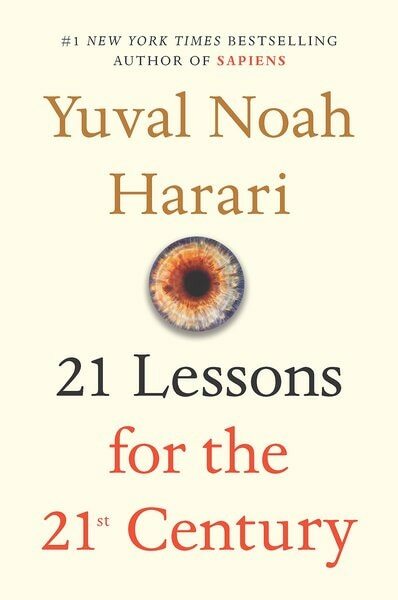 21 Lessons for the 21st Century is, no doubt, a worthwhile read as it highlights the pressing matters that we will face in the years to come. The issues touched upon above are but a few of the numerous mentioned in the book. Though the conclusions and solutions offered by the author may not sit well with everyone, they are certainly food for thought and add to the ever-growing voice of those who believe that mankind is at a crossroads with its step being swayed towards anarchy of a colossal size.